The Order is unofficially led by an egocentric Psyker by the name of Black Maru who has been forcibly “coerced” by some of the higher ranking Sanguinary Priests to hunt for a cure to end the cursed flaw in the Blood Angels gene-seed. Whilst a capable strategist and formidable warrior, Maru is constantly fighting an internal battle; torn between his love of bossing people around and his love of doing as little as possible. It’s widely agreed that if Maru spent less time avoiding his responsibilities, and more time actively seeking a cure, he could very well have completed his task and be free of Corbulo’s scornful watch. Below is my First Librarian model who will represent Black Maru on the battlefield. 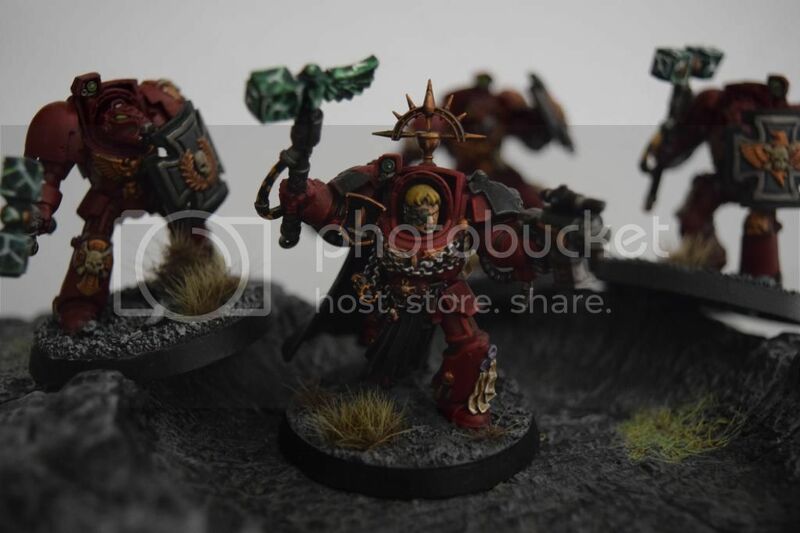 He is kitbashed from a Dark Vengeance Librarian, with a SG jump pack and a Space Wolf Power Axe. I painted him a little over a year ago, and I'd like to think I've gained some skill since then. Although I appreciate he's not painted to a great standard, I probably wont re-paint him anytime soon. Red Fox is an ancient Blood Angels warrior and an old friend of Maru's. Over a hundred years ago, Red Fox led a glorious crusade against a tendril of Hive Fleet Bandersnatch, a Tyranid Swarm which had been devouring the bland and uninteresting planets of Beige IV. Sadly, shortly after receiving a medal for his bravery, he was involved in an accident involving Mephiston, a bottle of coconut skin cream and a poorly serviced Land Speeder. Because of the blows to the head he received, Red Fox suffers from bouts of short term amnesia. Feeling he was no longer fit for duty, Dante moved Red Fox into an early retirement. As the years went by, Red Fox became depressed and threw himself into a compulsive routine of Protein Shakes and Jane Fonda workout videos, determined to buff himself up and prove he was still a useful vessel for the Emperor's wrath. One afternoon, whilst in the shower after a particularly intensive workout at the gym, his body aching and his mind troubled, Red Fox fell to the dreaded Black Rage. It was 4 hours into his naked rampage that a crack team of Militarum Tespestus finally managed to sedate him and put him in a stasis chamber. A call went out to Asteroth the Grim and within the week the stasis chamber was being prepared to unfreeze its frothing prisoner. Much to everyone surprise, when Red Fox stepped out from the chamber he seemed completely rational and sound of mind. It transpired that Red Fox had suffered from another one of his periodical bouts of short term amnesia and had completely forgotten the effects of the Black Rage. Asteroth, unimpressed by his time being wasted and his non-reimbursable travel expenses, promptly packed his axe in his suitcase and left. Since then, Red Fox has had several relapses, falling into uncontrollable rages and wreaking havoc to anyone that gets in his way, only to wake up several days later having no memory of what had transpired. Because he has been deemed completely unstable and unfit to duty, Red Fox has been shunned from all official chapters and sub-chapters of the Adaptus Astartes. Maru however has welcomed Red Fox into the Order of Redemption to play the part of the "chapter's" Captain for the sake of the Imperial records. The Order (as Maru is more than willing to admit) is already made up of oddballs, outcasts, who better to play the figure-head than a senile warrior prone to psychotic breakdowns? 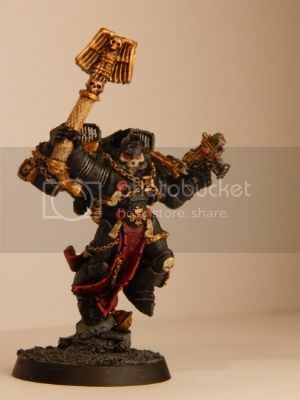 Like many of Black Maru’s chosen senior members, the statuesque Chaplain known only as “Charlie” has long and chequered past working for the Astartes. Originally indoctrinated into the Flesh Tearers, Charlie was ex-communicated for being too rational and sound of mind. Whilst his Blood Brothers could whip themselves into a savage fury, laying waste to their enemies in the name of the God Emperor, Chaplain Charlie often found himself preoccupied by handing out leaflets, explaining in plain English why the Emperor was the Heretic’s only option for salvation. It’s not that Charlie lacked the righteous zeal of his Battle Brothers, but his passion was more focused on giving thought provoking lectures to heretics, rather than immediately resorting to cutting their heads off. 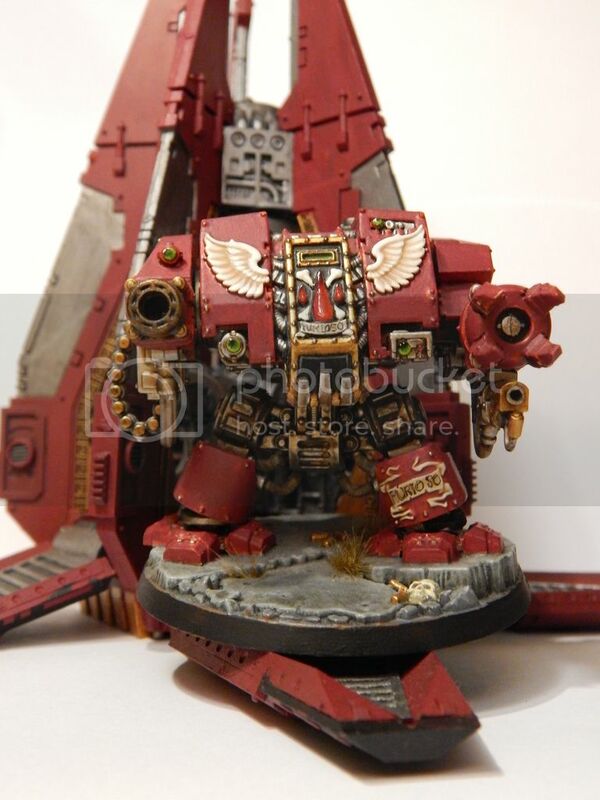 In short, Charlie was an embarrassment to the Flesh Tearers and their Chapter Master, Gabriel Seth was eager to blot any record of him from their otherwise fearsome reputation. Meanwhile, Black Maru was dealing with a problem of his own. Brother Corbulo, Keeper of the Holiest Grail, had transferred an unprecedented amount of Death Company Marines to Maru’s ever growing legions. The Administratum was visiting Baal on a routine check to ensure everything was in order, so Corbulo was eager to remove any trace of the homicidal lunatics in his charge. As such, all of the Black-clad fallen brothers were rounded up and quickly shipped off and placed under Maru’s ward. The result was Maru waking up one morning to find 50 gibbering, incomprehensible maniacs roaming around his headquarters, punching walls, screaming obscenities and licking his freshly washed windows. In a bid to distract the new arrivals from destroying any more of his property Maru tried everything he could think of to keep the new arrivals occupied. He tried playing soothing music, he tried sitting them down with the first season of Lost, but nothing seemed to stop the rampant destruction that followed everywhere they went. Without the budget to place them all in stasis, Maru decided it was time to invest in a Chaplin to keep these unwelcome guests in check until he could find an excuse to ship them off to wage war somewhere. And so Chaplain Charlie was welcomed to join Black Maru’s Order of Redemption, a venture of mutual benefit; Charlie was able to continue spreading the word of his beloved Emperor, whilst Maru’s Death Company (later dubbed, the Screaming Death) where now too preoccupied listening to Charlie’s long-winded sermons and Powerpoint presentations to bring upset to Maru’s tranquil base of operations. Well, that's all for now, but there will be more to follow. Coming up next its BIIIIIIIIIG CRISPIN!